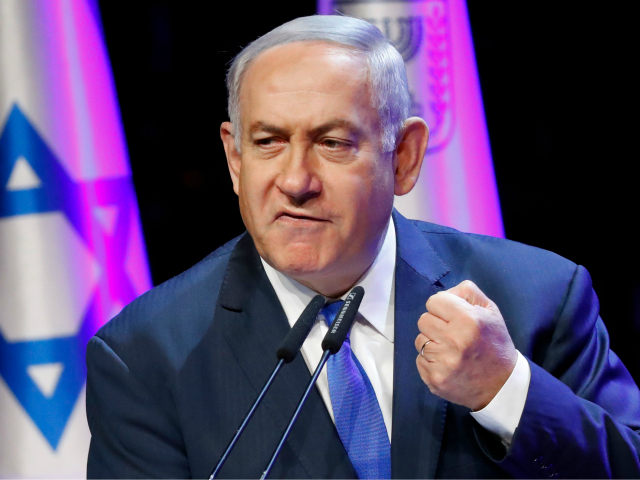 TEL AVIV – Prime Minister Benjamin Netanyahu on Saturday said Israel “fully supports” President Donald Trump’s “stand against the use and spread of chemical weapons” with the U.S.-led airstrikes on Syrian targets carried out earlier that day. Netanyahu added that “Trump’s resolve and Israel’s support remain unchanged” since last year, when the U.S. conducted strikes in the war-torn country after a sarin gas attack. “This morning, under American leadership, the United States, France and the United Kingdom demonstrated that their commitment to the fight against chemical weapons is not limited to declarations,” he added. In a joint operation with the UK and France, chemical weapons sites, including a storage facility and a research base, were targeted in the pre-dawn hours, constituting the largest military intervention since the Syrian civil war began. An unnamed senior Israeli official said that the joint military operation was an “appropriate” response to the chemical gas attack on the Syrian town of Douma last week, in which 42 people died and many others were left gasping for breath and foaming at the mouth. “Last year, President Trump made it clear that using chemical weapons crossed a red line. Tonight, led by the Americans, the U.S., France and Britain acted appropriately,” said a statement from the official. “Syria continues to carry out murderous actions and to be a base for these and other actions, including by Iran, that puts its territory, forces and leadership in danger,” the statement said. Israel was notified of the assault ahead of time, Israeli and U.S. officials confirmed on Saturday morning. Trump announced the joint operation on Friday, saying it was a direct response to the toxic gas attack. U.S. Defense Secretary Jim Mattis called the strikes a “one-time shot” and said there is no additional action planned for the immediate future. Gen. Joseph Dunford, chairman of the Joint Chiefs of Staff, also confirmed that there were no further strikes in the pipeline.